Segawa Kotetsu is the combat butler of the Segawa family. He is the older fraternal twin brother of Izumi Segawa. As a running gag, his hobby is his extreme love of trains and train turntables. He seems to be shy as he has never even had the confidenice to ask a girl out. It seems that his terrible luck with women has left him feeling bitter about the entire female gender but while he is at Hinagku's birthday party, he runs into Hayate and immeditaly falls in love with him, or his altar-ego Hermione Ayasaki. 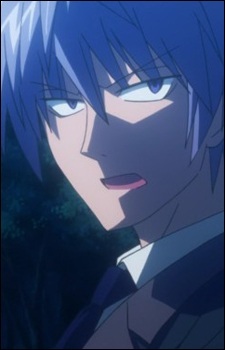 He soon learns of Hayate's identity from his sister, Izumi. He is very angered by this and kidnapped Nagi in order to bring Hayate out so he can see if he is still a butler even if he is wearing girls' clothing on, he did this to obtain his objective which is unknown right now. After Nagi had confronted him on his shallow attitude toward love in general, he vows to change his attitude and still likes Hayate even after discovering he was male during his conversion with her. Afterwards, he seems extremely hung up on Hayate, use various methods to try to spend time with him, such as challenging him to ping pong to get him to spend time in a hot spring they were both visiting. He is rarely seen in the anime, making brief appearances once in a while, although Izumi has referred to him several times.